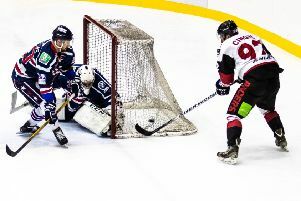 Murrayfield Racers will be in pole position to top the eastern section of the Stuart Robertson Cup if they beat Kirkcaldy Kestrels at Murrayfield tomorrow in their penultimate group game. Victory would also move them closer to a cup-final showdown with west section winners, North Ayrshire Wild, to be played in the new year. The game also sees Racers take part in their first ever Teddy Toss (face-off 6pm) when, in conjunction with local charity Helping Hands, fans are asked to bring a bagged soft toy to throw on the ice after the first goal is scored. The players will collect them and they shall be distributed to children’s organisations across the Edinburgh area. 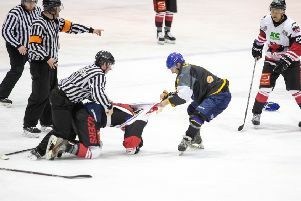 There may be hundreds of bears in attendance for Kestrels’ first trip to Murrayfield this season, but Racers director of hockey Tony Hand has warned it will be no picnic against the Fife outfit after already overseeing two close games between the teams in Kirkcaldy, a 3-2 win in the Stuart Robertson Cup and a 2-2 tie on Scottish National League business. Hand said: “This is a huge game for us, and gives us a really good opportunity to get into a final, which is fantastic. It will be a tough game against Kirkcaldy and we need as much support as possible. Not only that but, having the first ever Racers Teddy Toss and the opportunity to give something back to kids in Edinburgh, makes it all the sweeter. We’re all really looking forward to it, it should be a great game.